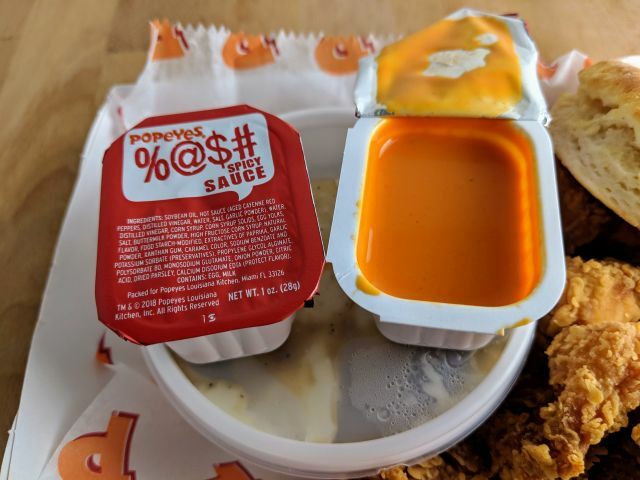 Popeyes' %@$# Spicy Sauce (apparently, the employees call it "Bash Sauce") is described by the chain as "so good, there are no words." Fortunately, I do have a few words to say about it. I got the sauce as part of a $5 Boneless Bash combo, which includes six boneless "wings," a side, a biscuit, and a sauce of your choice. 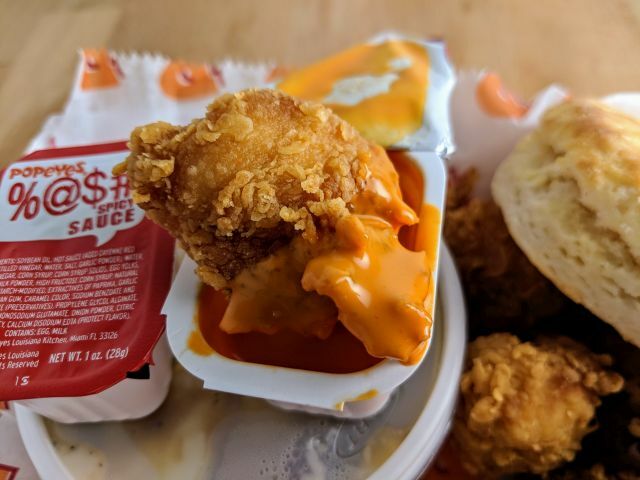 The short of it is that Bash Sauce is basically Buffalo sauce mixed with mayo. Opening up the lid yield a vinegar aroma with just a tinge of buttermilk. Flavor-wise, the sauce offers a definite tangy note of vinegar, a little creaminess and richness from mayo and buttermilk, and just a slight touch of cayenne flavor plus a moderate dose of cayenne heat. It's a slow burn that builds but doesn't linger all that long. I should note that the sauce is fairly thin compared to other mayo-based sauces. Put it this way: if it was in a bottle, you'd have no trouble getting it out. Just tilt and go. Taken altogether, Popeyes %@$# was just sorta ho-hum for me. Given the gimmicky name, I was hoping for something more novel than Buffalo sauce and mayo. Some extra herbs or spices might have made it more interesting.